From Gandhi’s guidance of India’s independence from Great Britain to Martin Luther King Jr.’s nonviolent demonstrations in the United States’ Civil Rights Movement, examples of peaceful resistance offer historic lessons on building peaceful nations. 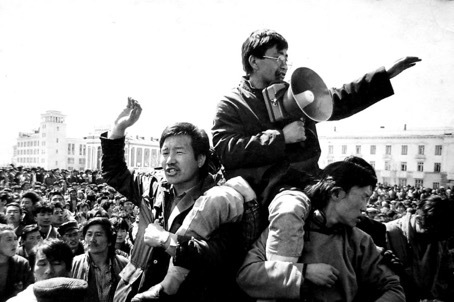 Mongolian youth lead protests in 1990 led by movement leader Zorig. In Mongolia, from 1989 to 1990, young people led large public rallies, protests and hunger strikes that led to the peaceful transition of Mongolia into a free, democratic nation with a growing market economy and a commitment to human rights and freedoms. The peaceful nature of the revolution makes it remarkable and has commanded the attention of scholars and activists who support the peaceful reunification of the Korean peninsula. On July 17, 2018 in Seoul, Korea, the International Republican Institute (IRI) and the Global Peace Foundation (GPF) co-hosted a meeting on The Process of Peaceful Change in Mongolia and One Korea. IRI is a non-partisan, nongovernmental organization that advances democracy and freedom around the world by supporting and empowering civic groups. IRI has empowered political parties during Mongolia’s democratization, funded education programs for North Korean defectors and is currently funding reunification efforts for the Korean peninsula. Director of the Korean branch of IRI, Se-Hyuk Oh, welcomed the distinguished group to the meeting. Jong-Chun Park, Secretary General of GPF Korea, reflected on GPF’s One Korea International Forum held in Ulaanbaatar, Mongolia in August 2018. Scholars, parliamentarians, and civic leaders gathered from Mongolia, China, Russia, the USA, and Korea to explore the relatively peaceful change that took place in Mongolia and the cause that united the people for fundamental human rights and freedoms. Speakers at the forum explored lessons from the Mongolia model that could inform the process of reunification and peace on the Korean peninsula. Mr. Park expressed his hope that this could be the basis of their continued discussion and collaboration. Even the unfavorable outcomes of the revolution can be food for thought, as Dr. Jin Shin, Professor and Director of the National Strategy Institute of Chungnam National University, recalled a discussion he had with a Mongolian scholar at the Forum. He conveyed the scholar’s concern for the continuing division and how it would impact the future of the Korean peninsula. The scholar recounted how a lack of consensus between inner and outer Mongolia led to a loss of parts of Mongolia and an overall sense of national identity. Despite such setbacks, the path from an underdeveloped, state-controlled nation to a free democracy with a growing economy in just few short decades is noteworthy. Attendees promised to continue sharing their ideas and research and form new ways to build international solidarity for reunification efforts. This meeting of civic leaders underscores the importance of civil society in the process of reunification of the peninsula. The process of reunification rests, not solely on the governments of North and South Korea, but in the hands of the Korean people. The nature of civic organizations enables them to establish people-to-people connections, and find specialized and innovative solutions that address specific social issues. Civil society is a natural and crucial player in the process of reunification. Thus, an active and engaged citizenry that can bring communities and societies together based on shared values and goals, will be vital for reunification. Learn more about the One Korea Global Campaign and find out how you can get involved today.